Kalispell is our home, and we’re proud to say it. We love enriching lives by providing a strong Christian community of support and loving care. There’s no other place we’d rather call home. That being said, we’re also proud of the well-known attractions in the area, because they give our residents fuller, vibrant lives. It’s healthy to get out and about, socialize, try something new, and create memorable experiences. One place our residents rave about is Conrad Mansion. 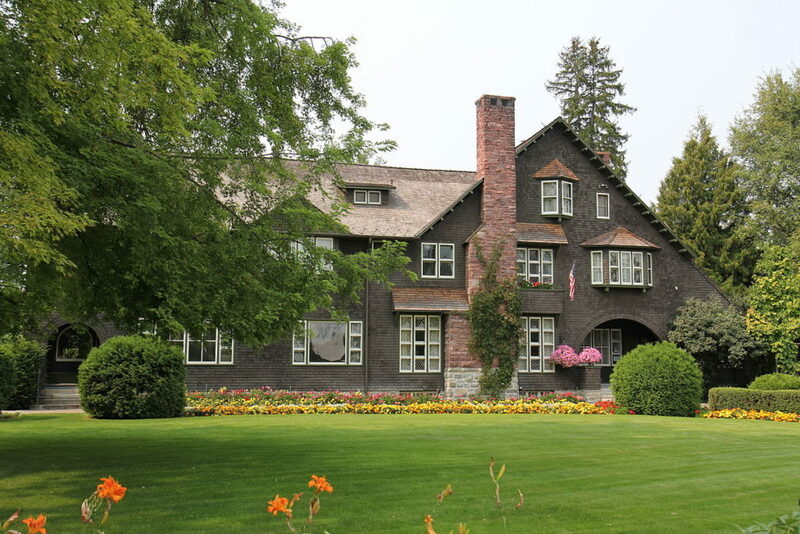 The Conrad Mansion Museum is located in Kalispell’s eastside residential area. The beautifully maintained property was home to the Conrad family and Kalispell’s founding father, Charles Conrad, beginning in 1895. It features 13,000 square feet, 3 floors, and 26 rooms. Today, the mansion is filled with 90% of the original family furnishings, and is open to the public for guided tours. If you consider visiting the Conrad Mansion this year, keep these tips in mind. Check out the latest exhibits. While the 2019 Clothing Exhibit hasn’t been announced yet, the 2018 exhibit was titled “Black in Fashion” and it featured 15 examples of women’s attire, one child’s dress, and one example of men’s formalwear from the 1890s to 1950s. See up close and in-person real attire worn as early as the 1890s, and learn about the different uses for such clothing. For example, wearing black today means something different than it did one hundred years ago. When worn as formalwear, black conveyed elegance; but when worn by working class and servants, black conveyed plainness. Call ahead, especially during the offseason. Did you know anyone can book a private event at the Conrad Mansion? It offers both outdoor and indoor rentals for weddings, private tours, family get-togethers, social luncheons, business meetings, company parties, or other special occasions. To ensure you can access the entirety of the tour, call in advance. You will want to visit the property when there is no private event. Plus, off-season tours (Oct. 16, 2018 – May 14, 2019) are only available with a minimum of 24-hours notice, so you have to call 406-755-2166 prior to your visit, anyway. Plan to grab something to eat before or after. To keep the property, furnishings and interior beautiful, no food or beverages are allowed in the mansion. But you won’t be thinking about food or drinks, anyway, because there’s so much to absorb while touring the grand property. Did you know tour guides are required to memorize 23 pages of notes before earning the honor of leading tours? You’re sure to hear stories and insights that delight, especially if you appreciate the history of the city of Kalispell. Plus, adding lunch or dinner to your trip to Conrad Mansion makes for an eventful outing with friends or family. You can discuss your favorite part of the mansion and all the unique facts you learned. Kalispell is home to many great organizations, activities, and landmarks, but Conrad Mansion is by far the most impressive. The grand property represents the beginning of our town’s legacy, and it represents the thousands of residents who’ve looked upon it all these years. Why not schedule an outing and pay it a visit? Locally based and not-for-profit, we are mission-driven and locally owned and managed. The truth is, we’ve always given our honest best to seniors in the Flathead Valley. This is our home, and this is our mission: to enrich lives by providing Christian communities of support and loving care. Learn more about the senior living lifestyle at Immanuel Lutheran Communities today.